Sand cakes have been around in England for a very long time but they don’t seem to turn up all that often these days, unless I'm missing them somehow. In fact, various types of sand cakes seem to surface more frequently in other parts of the world such as Australia. The cakes don’t have sand in them, honest. They’re made largely with potato flour or cornflour (or cornstarch as it’s known in some parts of the world), which gives them a light and crumbly texture – a ‘sandy’ texture, I suppose. It’s a shame that they’re not better known because they’re beautifully light, very easy to make and they taste a lot better than sand. Traditionally the cakes are associated primarily with Leicestershire, although in my head they’re forever associated with Ironbridge in Shropshire because that’s where I first came across the cake in a small, old-fashioned tea shop quite a few years ago. Many of the traditional recipes call for the cake to be iced with a light, usually lemon, icing but I've added a drizzle topping instead just for a change. Some people prefer to serve the cake without any form of topping and it works very well as a dessert that way alongside fruit and something creamy. I use a combination of cornflour and potato flour but replacing the potato flour with more cornflour will work – I'm just being a bit fussy with the texture. I've come across versions of the cake in the Lake District too and that explains why I add some rum – you can replace this with a lemon or orange liqueur or leave it out altogether. Butter an 18 cm round cake tin – a springform or loose-bottomed tin is easiest for this cake, but the mixture is quite thin so make sure it doesn't leak. Preheat the oven to 170°C. Beat the butter and caster sugar together thoroughly until very pale in colour. Gradually beat in the eggs, followed by the lemon zest and rum. Mix the three flours and the baking powder together, sift them over the mixture and fold in. Put the mixture into the prepared tin, level the top and bake for 30 minutes or until a knife inserted in the cake comes out clean. The turnip has an image problem in this country. Perhaps that's not so surprising. I can remember some pretty terrible meals accompanied by grey and unpleasant turnips in the distant past. Fast forward a few years and I was eating turnips in France and realising that they can be absolutely delicious. I've been growing an old French variety ‘Des Vertus Marteau’ for a couple of years now and the flavour and texture is probably the best I've found. Better still, they’re really easy to grow and quick to crop. So if you have a little spare ground, then I recommend trying some. Unless you live in France, you’re unlikely to find the seeds of this or other similar French varieties at the local garden centre but they are quite widely available from suppliers of heritage seeds. (Assuming that new EU regulations don't remove this option). Chervil has a bit of an image problem in Britain too. It never seems to be as widely available as other fresh herbs in shops and supermarkets. But chervil has a lovely flavour and looks good as a garnish so I don’t really understand why. Again, the good news is that it’s very easy to grow. This is my favourite way of cooking the young turnips, which have a real affinity for mustard and lemon. It's an excellent accompaniment to simply cooked duck but it will also sit happily alongside other meats and poultry. It can even form part of a vegetarian mezze. The amounts given here can be varied to taste but this should serve 2 as a side dish. You could use parsley in this dish if chervil can't be found and if you don’t have enough turnips, then you can add some sliced carrots to make up the numbers. If you don't fancy these particular flavourings, I should add that the turnips also work very well in spicier dishes. For instance, a little honey and lemon juice with Moroccan spices can be delicious. Take 4 or 5 small, young turnips (around 400 g before preparation). Wash and either scrape or peel them. Cut them into thin, but not wafer thin, slices. Add a little duck fat (or goose fat or butter) to a generously sized frying pan and place over a low to medium heat. Add the turnip slices and sauté gently, turning every now and then, until lightly browned (about 10 – 15 minutes, if you’re being really gentle). Season well and add 1 teaspoon of Dijon mustard, a generous squeeze of lemon juice and just enough chicken or vegetable stock to cover the turnips. Scatter over about 2 teaspoons of chopped chervil. Cover the pan loosely and simmer gently for 20 – 25 minutes or until the turnips are very tender. Keep an eye on them and don’t let the pan dry out. Remove the lid, stir in another teaspoon of Dijon mustard (or half a teaspoon if you’re less keen on mustard than I am) and another generous squeeze of lemon juice. Continue cooking gently until the sauce has thickened and coated the turnip pieces. Adjust the seasoning and sprinkle over some more little pieces of chervil before serving. Since chervil is so important to the dish, I'm adding this post to the August Cooking With Herbs Challenge over at Lavender and Lovage. Some of the recipes on As Strong As Soup can be pretty simple, but I think this is the first with only two ingredients. For this month’s Random Recipe cookbook challenge Dom of Belleau Kitchen asked ‘If you had 10 seconds to grab one book, which one would it be?’ I was pretty certain that I would either grab a comprehensive, general recipe book or one that would give me a nostalgic glow (Floyd on France, perhaps). It didn't work out that way. When I gave myself 10 seconds, I panicked and just grabbed the biggest book available. On my shelves that’s Larousse Gastronomique. Not an obvious choice since it’s not really a recipe book as such. But I randomly opened the book and randomly selected a column and was somewhat disturbed to see that the first recipe was included in the entry for Molecular Gastronomy. Fortunately, though, it turned out to be Hervé This's method for creating Chocolate Chantilly. Essentially this technique allows you to create a chocolate cream or mousse using only chocolate and water. It gives a purity of taste that’s impossible to equal by any more normal method. Conventional wisdom and experience tells you that water and chocolate never mix and this technique demonstrates just how wrong that is. You may have seen Heston Blumenthal demonstrating this recipe on TV and you can find it on the BBC site here, although sadly Dr This is not credited with its creation. I’d never tried this before, but I'm very pleased (and a little surprised) to say that it works beautifully. Don’t expect it to work instantly. You could be whisking for 5 minutes or so – it depends on how quickly the chocolate emulsion cools. You can substitute some other flavoured liquid for some or all of the water. Some fresh orange juice or coffee are probably the obvious choices. In fact a little orange heightens the flavour very nicely. Mr B says that it will serve 4 and that’s true but it’s such an intense and pure flavour that it could easily serve twice that number alongside berries or something creamy. If you’re anything like me, then whenever you buy a delicious, ripe melon, you have the problem of leftovers. I wrap the excess melon and stick it in the fridge for the next day. I then usually forget that it's there and discover sad, dried up melon some days later. So that's why I came up with this solution to the problem of excess melon. Actually, it turns out that this sorbet is so refreshing and so ridiculously simple to put together that I'm quite happy to buy yet more melon just to make it. Unless my memory is playing tricks on me (yet again! ), this sorbet is based on a recipe by the great Frédy Girardet. I'm sure that the original would have been more refined and would not have contained Malibu. But Frédy Girardet is a great chef and I'm most definitely not. The sorbet will certainly be smoother if made in an ice-cream machine, but it will still be very pleasing if you simply freeze it in a shallow container and rough it up a bit with a fork once it’s frozen. I used a galia melon but any ripe melon with sweet, reasonably dense flesh will be fine. Watermelons, not surprisingly, are too watery for this technique and won’t produce a smooth texture. Scoop out the melon flesh, discarding any seeds, and weigh it. Put everything in a blender or food processor and whiz until smooth. Pour into an ice-cream maker and freeze in the usual way. Since this is a decidedly summery dish I'm sending it over to the Four Seasons Food 'Summer Puds' challenge. If you happen to wander down to south west France, then sooner or later the Pyrénées will come into view. At that point, hungry and tired from your journey, you may be tempted to sample some of the local sheep’s milk cheese. Don’t be surprised if you’re offered some jam with it. The black cherry jam of the region is a classic accompaniment to the slightly sharp, rather nutty and definitely delicious cheese. This is my somewhat anglicised and eccentric version of cherry jam inspired by that region. It makes a fine alternative to membrillo or similar quince jelly or paste. Any good, ripe cherry can be used. I know it’s not very serious jam making but this recipe will make just a single jar. I keep the amount small because cherries can be expensive and, more importantly, because I tend to shove jam to the back of a cupboard and forget about it if I make too much. It’s easy to scale the recipe up, if you want to make more. I know that if you’re not used to making jam then the setting point can be a concern. The great thing about this jam, though, is that it’s really down to your personal preference how set the jam should be. Soft set jam will spread and scoop nicely rather like a sauce or loose chutney while a firmly set jam will be much more in line with a quince jelly. In other word, this is a pretty worry-free jam; if you get it slightly wrong the result will still be delicious and you can always claim that it was deliberate. The jam will accompany a cheese from the south west such as Ossau Iraty very well, but it will work with other cheeses too. A slightly sharp flavour in the cheese is best I think. To be honest, this jam also works perfectly well if you don’t have any cheese and just spread it on toast or brioche. Remove the stones from the cherries, then simply mix everything except the sloe gin together in a non-reactive bowl. Cover and leave overnight. Take off the heat and stir in the sloe gin, if you’re using it. Let the jam cool a little, pour into a sterilised jar and seal. There are different types of tarte au sucre from the various regions of France and I've not found one that I don’t like yet. I first came across this particular tart in Normandy (in the Cotentin, to be precise). It’s a very northern French type of tart in that it’s a brioche-like dough with sugar and the local, rich crème fraîche on top. Probably not the healthiest thing you’ll ever eat, but very satisfying nonetheless. The sugar used in the topping varies from recipe to recipe. I prefer some combination of brown and white but use whichever you fancy. I used white sugar crystals (or pearls) as part of the topping just for a little contrast in texture but it’s not critical, I'm just being fussy. A stand mixer fitted with a dough hook is very useful when making the base of the tart. Of course, you can make it by hand but I'm not really convinced by the ‘kneading is good for the soul’ argument. I find incorporating the butter into the dough by hand a little tedious. This mixture will fill a tart tin of 32 cm diameter, but don’t worry if you don’t have one. You can simply flatten the dough out to roughly that size on a lined baking sheet, raising the edges a little in case of crème fraîche overflow. It might not look quite as neat at the edges, but this isn't a gourmet restaurant dish, so who cares? The tart is fine on its own, but it also goes well with fresh berries or a fruit compote and a dollop or two more of crème fraîche. It should serve at least 12, although it’s quite difficult to avoid getting greedy and cutting larger slices. Warm the milk, stir in the 1 teaspoon of caster sugar and then add the dried yeast. Stir vigorously until the yeast dissolves and set the mixture aside. Place the flour and the 2 tablespoons of caster sugar in the bowl of a mixer. Add the cooled milk and yeast mixture and the eggs. Bring the dough together using the dough hook of the mixer. Once everything had been thoroughly combined, start adding the butter a little at a time while continuing to knead. Once all the butter has been completely worked in, continue kneading for a few extra minutes. The dough should now feel reasonably elastic. Cover the bowl and leave the dough to prove in a warm place for 1 to 1½ hours until roughly doubled in volume. Preheat the oven to 170°C. Butter and flour a 32 cm tart tin (or simply line a baking sheet if you don’t have one – see above). Knock back the dough, then press and shape it into the tart tin (or spread it out onto the baking sheet, raising the edges a little). Now add the topping. Dot small pieces of the butter around the tart. Sprinkle over both sugars. Finally, pour on the crème fraîche. If it’s a good, thick crème fraîche, then it’s more a case of dropping blobs of it over the surface of the tart as evenly as possible. Don’t worry if the topping isn't completely evenly distributed, it will spread out as it bakes and, anyway, a little unevenness is part of the charm of the tart. You could thin the crème fraîche with a drop or two of milk to get a more even covering, if you prefer it that way. Bake in the preheated oven for 25 minutes until the edges look golden and the filling appears amalgamated and very inviting. Allow to cool before serving. The cherry trees at the local pick-your-own farm appear to be laden with fruit, which hopefully will begin to ripen nicely over the next few weeks. So I thought I'd get in quickly with this recipe that I've been saving up since the last year's cherry season. This is an easy and refreshingly different little pickle that works particularly well alongside cold meats, terrines and pâtés, but will also sit very happily alongside cheeses and richer meats like duck. As a bonus, once you've eaten the cherries, filter the pickling mixture and you’ll have a very fine cherry vinegar that can be used in salad dressings and marinades. The cherry vinegar is also excellent when used to deglaze the pan after cooking beef, lamb or duck. There are a number of old British recipes for cherries in vinegar as well as many different versions of ‘cerises au vinaigre’ in various parts of France. My version is actually based on recipes from the Picardy region and I reckon that makes it virtually local. Actually, this version is not really typical of most British or French recipes. Traditional British versions are usually spicier and often use the herb English mace, while many French recipes contain cinnamon and cloves. If you’d prefer the spicier flavour, then add a piece of cinnamon stick, some coriander seeds and maybe a few cloves to the vinegar before heating it. You could also substitute English mace sprigs for the tarragon. The amounts in this recipe will fill one jar of around 750 ml but treat the quantities here as a guide, since the size and shape of the cherries will make a difference to how many you can fit in a jar. Essentially, you should aim to fill your chosen jar three-quarters full with cherries and then fill it to the top with the vinegar mixture. Store the cherries for at least 2 – 3 weeks before using, although some people consider it a crime to eat them before 10 –12 weeks. The cherries should keep for at least a year but are so good with summer salads and picnics that they don't usually last very long at all. Sterilise a suitable 750 ml jar. Wash and dry the cherries. Don’t remove the stalks but cut them off close to the cherry. Don’t stone the cherries. Pack the cherries into the jar until it’s around three-quarters full. 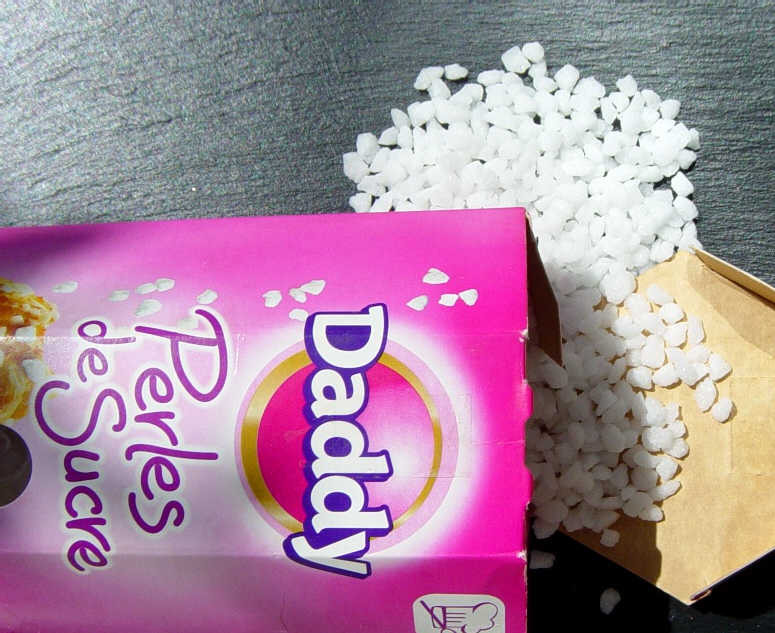 You can pack them in quite tightly but don’t crush them. Tuck the tarragon sprigs and the bay leaf in among the cherries. Put the vinegar, sugars, lemon zest, salt, pepper and nutmeg in a pan and place on the heat. Bring to the boil, stirring frequently to ensure that the sugar has dissolved completely. Allow the mixture to boil for a minute or two, then take off the heat and let it cool. Pour the cooled vinegar over the cherries until the jar is full. Seal and place in a cool, dark cupboard for at least 2 – 3 weeks. When serving, remember to warn people about the stones. I haven’t added any recipes to the blog lately because, due to circumstances being completely out of control, I haven’t cooked anything for several months. I'm hoping that situation will change soon, but for now here’s something that I baked last year and didn't get around to posting. I'm aware that the world is in danger of disappearing under a sea of chocolate fondant and coulant recipes but they’re undeniably delicious and decadent and there’s still something special about cutting into a little cake and watching the chocolaty loveliness flow out. This particular version is adapted from a recipe by Pierre-Yves Lorgeoux of the ‘Le Pyl-Pyl’ restaurant in Vichy. I’d love to say that I've been there but I have to confess that I saw it on an episode of ‘Les Escapades de Petitrenaud’ a while ago. It does look to be an excellent restaurant, though, so if you’re ever in the area maybe you could go on my behalf. You can find the original recipe here. I can still remember the first time I ate a chocolate coulant (or was it a fondant?) on a warm summer night in a little restaurant near the Picasso Museum in Paris. They say you never forget your first time. Ah, it seems such a long time ago now. Funnily enough, that’s because it was a long time ago. This will make 4 little coulants. Preheat the oven to 180°C. Thoroughly butter four ramekins and dust generously with icing sugar. Pour off any excess icing sugar. Melt the butter and chocolate together in a bowl placed over simmering water, with plenty of stirring. Set aside to cool a little. Whisk the eggs with the honey and agave nectar. Once thoroughly mixed and lighter in colour, gradually pour in the chocolate and butter mixture while continuing to whisk. Stir in the flour followed by the nuts. Pour the mixture into the ramekins and place in the oven for 12 – 14 minutes. It’s difficult to be exact about the timing since I've found to my cost that ramekins heat up at very different rates. You want the edges to be spongy but set and the centre to be very soft without feeling too liquid if you touch it lightly. As soon as they’re out of the oven, run a knife around the inside edge of the ramekins in case of any recalcitrant sticky bits and invert the coulants onto serving plates. If they seem to be sticking too much or you just don’t fancy the stress, you can always eat them out of the ramekins. It might not look quite so impressive but they’ll taste just as good. Personally I like these just on their own but they would certainly go nicely with a little ice cream. They’re fairly rich – even I couldn't eat two. Well, maybe not. Although I'm the homeliest of home cooks, every now and then I get an urge to recreate something that I've eaten in a restaurant and today is one of those occasions. This dish probably started out long ago as a traditional Parsi dish but by the time that I came across it in a south London restaurant it had been adapted to British tastes and to restaurant cooking. Sadly, I didn't get the recipe at the time and the restaurant is long gone now. In my attempts to recreate the dish I've used some decidedly inauthentic ingredients. But who cares? It works. The dried fruit brings a lovely sweetness to the dish while the spices add both depth of flavour and fragrance. There are a lot of ingredients listed, but it’s actually pretty easy to put together. If you can, allow yourself enough time for the overnight marinade – it really does make a difference. The dish is fine on its own but it would also sit well alongside a vegetable curry or you could serve it with rice if you happen to be really hungry. A simple chutney would also be good – lemon chutney would be ideal. It should serve two fairly generously. Mix together all the marinade ingredients in a non-reactive bowl, add the lamb, cover and leave in the fridge overnight (or for a few hours, if you’re in a hurry). The next day, sweat the onion in a little oil over a low heat for at least 10 minutes. Add the ginger and continue cooking for another 5 minutes. Add the lamb and the marinade and stir in the tomato purée. Pour in water until the lamb is almost covered, bring to a simmer, cover the pan and let it cook very gently for an hour. Stir now and then and top up the water if it starts to dry out. After an hour, add the apricots and raisins. Stir in the cardamom and fennel seeds and the ground almonds. Season with a little salt. Cover the pan loosely and continue cooking for another half an hour. The sauce should be quite thick – if it seems too thin, then remove the lid during this last half hour but, on the other hand, add a little water if it seems too dry. Stir in as many cooked new potatoes as you fancy for the final 15 minutes or so. Once the cooking is complete, stir in a dash of lemon juice to freshen the taste, add a little more salt if it needs it and sprinkle with the coriander leaves just before serving. This is a classic and simple way of making a cake that turns up with minor variations in quite a few different countries. I first came across it in France where it often seems to be the first cake that children are taught to make because it’s easy, very forgiving and there’s no weighing needed. For this month’s Random Recipe challenge Dom of Belleau Kitchen has asked us to select from our cuttings, clippings and old hand-written recipes. I'm very happy to do that – in fact, I should do it more often. Reaching into the magic cupboard containing my ‘library’ I came up with a notebook containing a mixture of hand-written and torn-out recipes dating from the 1990s. From that I randomly selected this yogurt cake, or I should really say ‘gateau au yaourt’ since it’s taken from a French magazine (although I'm not sure which one). Lemon or lime is more commonly used to flavour this cake, but grapefruit is actually a very pleasant change. I have to confess to making two minor changes to the recipe. I added the grapefruit liqueur because I just love the stuff – it’s entirely optional. I also reduced the amount of sugar a little. Classically, the ratio used for the cake is one pot of yogurt, two pots of sugar and three pots of flour but, although that’s easy to remember, I think it’s a bit too sweet. I used a plain, full-fat yogurt for this cake, but flavoured yogurts will work well. It’s also possible to use low-fat yogurt, provided that it’s not too thin – you will lose a little richness in the finished cake, though. Although I didn't add one this time, it’s quite common to make a syrup to drizzle over the cake, especially if you’re using it as a dessert. Preheat the oven to 180°C. Butter and line a cake tin. I followed the French instructions and used a 22 cm cake tin, which produces a relatively thin cake. If you’d prefer a taller, more British cake, then use a smaller tin – around 20 cm should be fine. Place the yogurt in a bowl. Wash out and dry the yogurt pot to use as a measure for the other ingredients. Whisk the eggs into the yogurt one at a time. Once the eggs are combined, whisk in the sugar followed by the flour. It’s best to add the flour gradually to ensure that you don’t get any lumps in the mixture. It’s important to combine everything well but don’t overdo the whisking at this stage. Gradually pour in the oil while continuing to whisk gently. Finally, stir in the grapefruit zest and liqueur. Pour the finished mixture into the prepared cake tin and bake for around 35 minutes or until a knife-point inserted into the centre comes out clean. You have to admit, that's a pretty easy cake. En effet, c'est du gâteau. If you've not come across this little pudding before, then you might think that the recipe sounds ridiculous. Well, it is a bit odd, but it does works, honest. It’s one of those puddings that separates out during cooking. You should end up with three layers: a crunchy sweet topping, a chocolate sponge middle and a chocolate fudgey base. It’s indulgent and delicious without being too ridiculously high in fat. What’s not to like there? This month’s We Should Cocoa challenge is being hosted by Lucy over at The Kitchen Maid and she’s asked us to share a famous chocolate recipe. Well this one’s famous. Or, at least, it used to be famous. Around the early to mid 1980s this dish seemed to turn up everywhere. OK, it’s old-fashioned and it’s not photogenic but it’s also delicious and it definitely doesn't deserve to be forgotten. I really don’t know the origins of this dish. When I first came across it in the 1970s I’m pretty sure that I was told it was named after the place in Essex. Later someone told me that it was named after a Mrs or Mr Debden. More recently I found that there’s a similar American dish called Denver pudding. As usual, I'm confused. You can eat Debden pudding warm or chilled but it’s at its best when served at room temperature, I think. A little cream, ice cream or thick yogurt would be a nice addition. This should serve 6 – although, frankly I could eat the whole thing myself. You’ll need an ovenproof dish that will hold at least 900 ml. Butter the dish. Preheat the oven to 170°C. Mix together the flour, the baking powder and the granulated sugar. Melt the butter and chocolate together over a bowl of simmering water or in the microwave. Stir the butter and chocolate mixture into the flour and sugar, followed by the milk. The mixture won’t look promising at this stage, but don’t worry – trust me, I’m a blogger. Pour the mixture into the prepared dish. Sprinkle the demerara sugar evenly over the mixture in the dish. Do the same with the caster sugar and, finally, with the cocoa powder. Now carefully pour in the cold water, trying to avoid disturbing the layers of sugar and cocoa as far as possible. Place in the oven and bake for 40 – 50 minutes until the top has formed a crust. (The type of dish you use is likely to make a difference to the cooking time. The old-fashioned enamel tins are probably the quickest.) Allow the pudding to cool before serving. If you’re not planning to eat the pudding immediately, then store it in the fridge, but preferably return it to room temperature before serving. 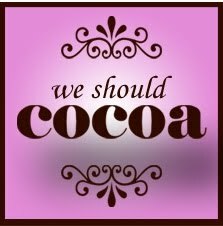 The We Should Cocoa challenge was created by Choclette at Chocolate Log Blog and Chele at Chocolate Teapot. Gaze into the window of a boulangerie in the north of France and there’s a chance that you’ll spot some palets de dames. Gaze into a number of boulangerie windows, though, and you might notice that the palets look very different. They’re a pleasing little treat that’s somewhere between a cake and a biscuit but sometimes they have a smooth covering of fondant icing, sometimes no icing at all and sometimes they contain currants or candied peel. Well, my version has a coating of apricot jam and a thin, lemony icing. I don’t really know if that’s authentic but it’s a recreation of the first palets that I ever came across while wandering around the Baie de Somme. If you’re unfamiliar with the Baie de Somme, then I’d describe it as an area of spectacularly large and rapid tides, seabirds, seals, fine seafood, salicorne (samphire), salt marsh lamb and some excellent baking among many other things. Happily for me, it’s also not all that far from the south of England. Incidentally, they’re called palets de dames because ‘jeu de dames’ is French for the game of draughts (or checkers, if you’re not British). I've only ever seen white icing being used, though, so it might be a one-sided game. Preheat the oven to 170°C. Beat the butter briefly, then add the icing sugar and continue beating until light in colour and very smooth. Gradually add the eggs while continuing to beat the mixture. Stir in the flour, followed by the ground almonds. The flour and ground almonds need to be thoroughly combined, but don’t overwork the mixture at this stage. Line a couple of oven trays with baking parchment or silicone sheets. If you want a regular and nicely rounded finish on the palets then you could pipe the mixture onto the baking trays in neat circles. That’s what a true patissière would do, I'm sure. On the other hand, if you don’t mind a touch of irregularity, then simply spoon small piles of the mixture onto the lined trays and flatten them a little with the back of the spoon. The amount here will make around 16 decent sized palets but you could make them smaller if you wished. Space the palets out to allow them to spread while baking. Bake in the preheated oven for around 10 minutes. The palets should feel fairly springy to the touch, should have a light golden colour around the edge but should remain pale in the centre. Cool on a wire rack. Once cool, spread the tops with some apricot jam. This will be easier if the jam is warmed a little first, but allow the jam to cool before adding the icing. Prepare the icing by mixing together the icing sugar, the lemon juice and enough water to produce a fairly thin but not too watery icing. Spread the icing over the palets, being careful to avoid disturbing the apricot jam layer too much. Allow the icing to set before enjoying with your favourite beverage. Store in an airtight container. Tea Time Treats is a blogging challenge created by Lavender and Lovage and What Kate Baked and this month's challenge, hosted by Lavender and Lovage, is for French treats. So that's completely within my comfort zone and I can't resist entering this little effort. Today we make another stop on my annoyingly long tour de cakes de France and find ourselves in the Creuse. The Creuse is a lovely region, although the last time I was there it was around this time of the year and it was really cold. Anyway, it’s there that you’re likely to find examples of a gâteau called ‘Le Creusois’ on sale. It’s also possible that you’ll find several similar cakes under slightly different names in French supermarkets, as well as a number of versions of gâteau Creusois recipes which people will tell you are the real, authentic recipe that their grand-mère made. They may well be authentic and ancient recipes – I have nothing but the greatest respect for grand-mères – but the particular cake sold as ‘Le Creusois’ was actually born shortly after the Beatles gave their last performance on the Apple roof in 1969. It appears that the gâteau was inspired by a 15th century parchment found in a monastery around that time, although the actual recipe itself is a closely guarded secret. I have no wish to upset the pâtissiers or any of the other residents of the Creuse with my efforts so let me make it absolutely clear that this is not a Gâteau Creusois, it just happens to be rather like one. Let’s think of it instead as my tribute to that fine region and as a delicious hazelnut cake. In the Creuse the gâteau (whatever it’s called) is most often eaten cold as a dessert with crème anglaise or crème fraîche and it’s truly delicious that way. On the other hand, if you want to break with tradition, try making a syrup of equal parts water and sugar, boiled together for a minute or two. Take the syrup off the heat and add a very generous glug of Frangelico liqueur. Once cool, make a few small holes in the top of the cake with a knifepoint and soak it with the syrup. That's what I did and it made the cake sink a little in the middle (a bit like the Creuse) but, in my opinion, it makes an even nicer dessert. Grease and line a 23 cm cake tin – a springform tin is probably best, if you have one. (You could use a smaller tin if you want a thicker, more British-looking cake, but I think the thinner gâteau is nicer as a dessert). Preheat the oven to 160°C. Mix together the sugar, flour and hazelnuts. Thoroughly beat in the softened butter followed by the whole egg. Whisk the 2 egg whites to the firm peak stage and stir about a third of them into the mixture to loosen it. Gently, but thoroughly, fold in the remaining egg white. Put into the prepared cake tin and level the top. Bake for around 30 minutes (but check after 25 minutes). When the point of a knife or skewer comes out clean, the cake is ready. Cool in the tin for 10 minutes or so before turning out onto a wire rack to cool completely. Soak with a Frangelico-laced syrup, if you’re so inclined (and I'd certainly recommend it). 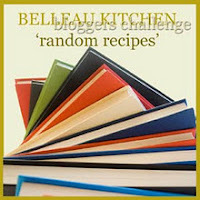 This month Dom of Belleau Kitchen is celebrating the start of the third year of his Random Recipe challenge and has graciously allowed us to select a recipe from our books in any way we choose. As an old hand at this particular challenge I thought that this would be a good opportunity to try some of the books that don’t make the usual selection list. I decided that the biggest challenge would be to select from the ‘lost’ books. ‘Lost’ in the sense that I did own these books once upon a time but now I have only a few recipes left. A couple of books suffered regrettable kitchen accidents while others haven’t survived house moves or have been loaned out and never returned. I missed these books enough to get photocopies or make notes of some of my favourite recipes from borrowed copies. So with a quick random grab from the pile of scraps I came up with a recipe for Country Captain. I copied this recipe from a book of British cookery that I had around 1980. (It was last seen somewhere in Tooting at about the time Ultravox released ‘Vienna’). I think it's a fairly accurate transcript of the recipe, although I suspect that I may have lowered the fat content and I have used a convenient can of coconut milk rather than the coconut cream block specified in the original. It's a deeply old-fashioned dish that I think is pretty typical of the sort of recipe that turned up frequently in the 1970s. I seem to remember the book saying that this dish had its origins during the Raj when British army captains stationed in the Indian countryside would have their cooks prepare mildly curried dishes suitable for Western tastes. This is almost certainly nonsense. Country Captain in one form or another turns up much more frequently in the US than the UK and was probably bought back from India to the US by the captains of trading vessels known as ‘country ships’. Whatever the truth of it, I haven’t made this simple dish for years and I must admit that I enjoyed cooking and eating it a lot. This will serve 4 people, although it’s remarkably easy to eat more than your fair share. At this point, I should tell you what the book was called. Sadly, I don’t seem to have written that down anywhere and with the passing of more than 30 years and the consumption of a fair amount of red wine I really can’t remember. If anyone has any idea, I'd love to know. Start the onion frying gently in a little oil. After about five minutes add the garlic and the spice mix. Fry briefly then add 300 ml of water. Bring to a simmer, stirring, and let the mixture bubble away gently until most, but not quite all, of the water has evaporated. Cut each of the chicken thighs in two. Add the chicken pieces to the onion and spice mix and stir them around for a minute or two. Pour in the coconut milk, bring to a simmer, stirring, and allow the mixture to blip away gently for 20 – 30 minutes until the chicken is tender. If the mixture starts to dry out, then cover the pan. Meanwhile, peel the carrots and cut into smallish chunks. Steam or boil the carrots until just tender. Stir in the cooked carrots, the mango chutney, the sultanas and the lime juice. Season with a little salt. (Although, it’s not in the original recipe, I added a few sliced and cooked mushrooms as well, just because I happened to have some). Return the mixture to a simmer briefly, sprinkle on some fresh coriander if you have any and serve with rice and a selection of chutneys. Palestine soup has nothing whatever to do with Palestine. It seems to have been given that name because it’s made with Jerusalem artichokes. Jerusalem artichokes have nothing whatever to do with Jerusalem and aren't artichokes. Anything that odd just has to be good. In fact, it’s one of my favourite vegetable soups and it so happens that it’s also very easy to make and, thankfully, low in fat. I first came across Palestine soup in cookery books dating back to the early 1900s, but I think the dish is a fair bit older than that. Most recipes combine the Jerusalem artichokes with turnips or potatoes, which maintain the creamy white colour of the finished soup. I like to add carrot, which provides a nice touch of sweetness but does change the colour. (Unless you can find a heritage variety of white carrot). A few years ago, Mark Hix published a Palestine soup recipe with some hazelnuts added, inspired by Auguste Escoffier’s ‘Purée de Topinambour’. The hazelnuts enhance the flavour of the Jerusalem artichokes beautifully, so I've borrowed that idea. Clearly Escoffier knew what he was talking about – as does Mark Hix, of course. This will make 3 hearty lunch portions or will serve 4 to 6 as a starter. Add a small amount of oil to a pan and cook the onion gently for at least five minutes until it starts to soften without colouring. Meanwhile, peel and slice the carrots finely. Add the carrot and rice to the pan and pour over the stock and milk. Cover the pan, bring to a simmer and let it gently bubble away for 20 minutes. Meanwhile, peel and slice the Jerusalem artichokes quite finely. Place the slices into water with a little lemon juice added to prevent discolouration. At the end of 20 minutes simmering, add the Jerusalem artichokes to the pan, season with a little salt and pepper (white pepper is best to maintain the colour), cover the pan again and bring back to a simmer. Keep the pot simmering for another 10 – 15 minutes or until the carrots and artichokes are tender. Meanwhile, lightly toast the hazelnuts. You can do this in a dry pan over a low heat or simply place them in a medium oven for 4 or 5 minutes. Be careful to avoid burning them. Remove the pan from the heat and allow the mixture to cool a little. Add the toasted hazelnuts and liquidise. If you're being very fussy, you can pass the soup through a fine sieve, but I don't usually get that fussy. Adjust the seasoning and add a dash of lemon juice if it needs it. Croutons are good with this soup, if you fancy them, and a sprinkling of parsley does no harm either. Many recipes finish this soup by adding cream. That does give it a touch of luxury, but I really don't think the soup needs it and I prefer to keep it low in fat. By the way, Jerusalem artichoke plants are rather like spindly, slightly unsuccessful sunflowers. They’re easy to grow but, since the plants can be very large (10 – 15 feet tall is not unusual), you’ll need a fair bit of space.